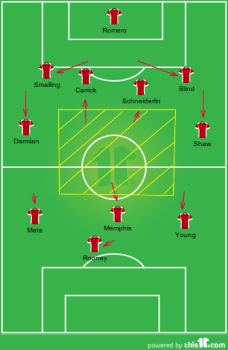 Manchester United Tactics Column: Better start? 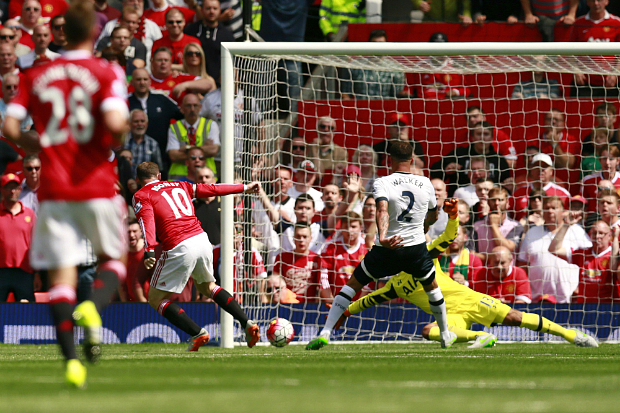 The first game of the season and Manchester United entertained Spurs in an early kick-off. Unusually Louis van Gaal chose to reveal pre-match that an un-injured player, David de Gea, would not play in view of all the interest in him from Real Madrid. The manager also revealed that Bastian Schweinsteiger and Marcos Rojo were not yet match-fit. 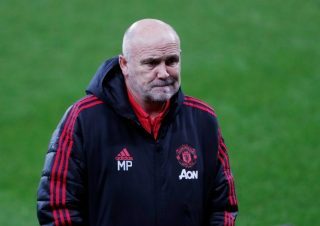 That left four of the five summer signings available for selection, how many would the manager pick as United looked for a better start than last year? Van Gaal has talked about the team shape employed here as a 4-3-3, although most commentators refer to it as a 4-2-3-1. In that a 4-2-3-1 can be read as a form of 4-3-3 with two pivots Van Gaal is right, but in terms of the way United are currently using this shape there are issues. In brief the team selected and shape was as most commonly seen on tour. Romero was introduced as the keeper with Smalling to the right and Blind to the left as centre backs, Carrick and Schneiderlin were the two pivots with Memphis in the number 10 role. 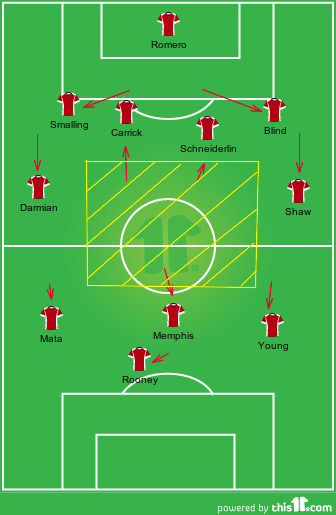 Young was positioned on the left, Mata on the right and Rooney as the single central front man. From the outset both teams pressed each other and both sought to play a high line. 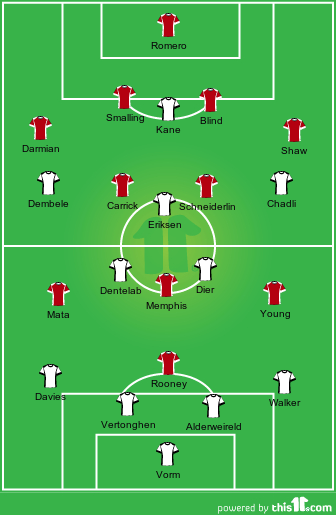 For United this meant both Schneiderlin and Carrick pushing high on the Spurs midfield pair of Dier and Dembele and Memphis pushing high alongside Rooney to close down the Spurs centre backs. Spurs did something similar and in fact their press was marginally more effective because they were stronger in the tackle. The consequence of this was that all first half chances came from a turnover of possession when a team had won the ball in the oppositions half, including Eriksen’s early chance, (which he should have converted) and United’s goal, (which came after Dentelab, under pressure from the press, misplaced a pass which Mata picked up). 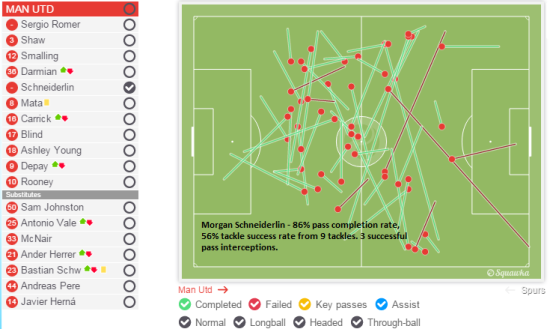 In the first 12 minutes Mata (twice) and Schneiderlin (once) lost the ball in their own half as a consequence of the Spurs press and on each occasion Spurs should have scored. When United had the ball the key problem was the space in the middle of the park between Carrick and Schneiderlin and Rooney and Memphis further forwards. 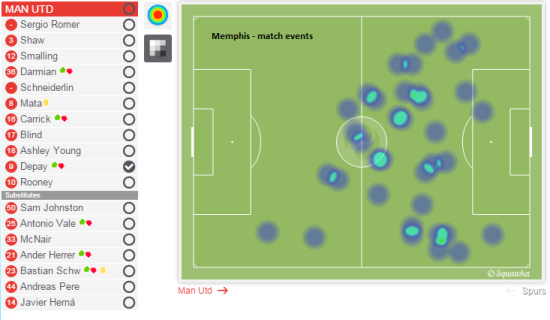 Memphis pushed very high, almost as high as Rooney; perhaps this was a consequence of his pressing the opposition, or perhaps he was trying too hard to make an impression on debut. Further back Carrick and Schneiderlin both tended to drop deeper towards goal as we looked to build up play out of our own third. Our two centre-backs split and the full backs moved forwards, which encouraged the pivots to play the ball square. 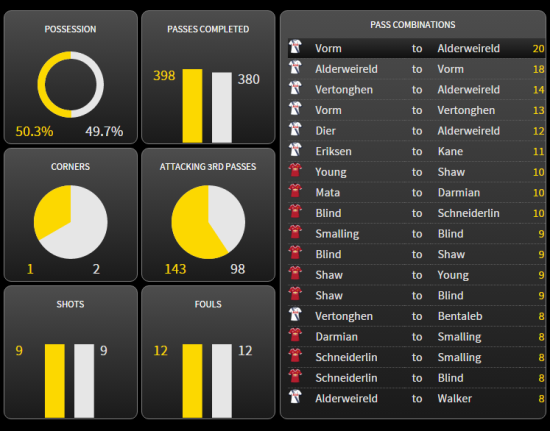 This helped Spurs to press the ball and pen United in the fullback areas. Effectively United surrendered control of the middle of the pitch and found themselves in trouble several times. 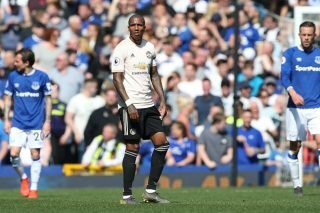 United’s defenders put Romero in difficulty on more than one occasion and he exacerbated the problems by playing a short return pass to a defender close to his own area. 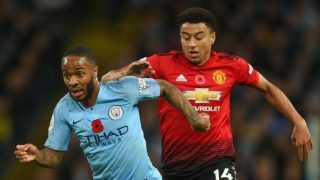 Sensing the need to overcome this problem Chris Smalling started to take the initiative and move confidently with the ball into the midfield areas rather than looking to predictably re-circulate the ball around at the back. This saw him often further forward than Scheiderlin and Carrick. On 60 minutes Van Gaal replaced Carrick with Schweinsteiger, (and so all United’s summer signing had made their debut in the game), and on 65 minutes Herrera replaced Memphis. 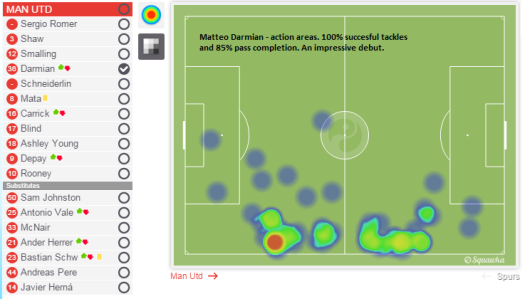 Whilst this didn’t create a flurry of chances United now had a better shape. Schweinsteiger looked confident in possession and was more prepared to step forward into higher areas when United had the ball. He passed early and well. Herrera was his usual busy self and whilst he didn’t make a big obvious impression on the game he did drop deeper to help reconnect the spine of the United side. United will need to work on the co-ordination of movement in possession between the midfield components. As mentioned above all United’s new players got some match time. The pick of the bunch was Darmian. He faded later in the game and was replaced by Valencia. This is perhaps inevitable as he adjusts to the pace of the Premier League. He was solid in defence and showed some good attacking intent at times. He completed 100% of his tackles and 88% of his passes. Bellissimo! Schneiderlin was almost as impressive despite concerns about midfield co-ordination. The one concern was the percentage of tackles won, (only 33%), and this was perhaps why, especially in the early stages, Spurs press seemed more effective. Nevertheless the signs look good. Schneiderlin – the little tailor. Schweinsteiger doesn’t look fully fit yet, (he is maybe carrying a few extra pounds), but his 30 minute cameo was promising. He gave away a few fouls and got himself booked but he always looked unflustered and in terms of his position play he was very confident. Memphis perhaps tried too hard. He played well and was an important part of United’s best spell immediately after the goal when he showed vision and no little imagination. His understanding with those around him may take a little time to click and he tended to take a little bit too much time on the ball, and consequently found himself bundled off it a few times. Many are asking why he is being played centrally behind Rooney rather than wide on the left. Perhaps there are two reasons for this; firstly Young continues to play well on the left and secondly playing in a central area will necessitate his making decisions quicker so has some educational benefit. On this showing that is something to work on; in the Premier League players will not give him time on the ball. Finally we come to Romero. As a goalkeeper using his hands and commanding his area he did nothing wrong and this was a solid confident performance. He struggled with the ball at his feet when outfield players pushed the ball back to him as they found themselves under pressure from the Spurs press. They played him into trouble and this was not his fault. He doesn’t speak English and that can’t help. He has only been at the club two weeks and so there can clearly be only a minimal understanding with his defenders at this point so all things considered this was a very good performance. This was a disjointed display. All United’s new players did fairly well but two issues sprang out. Firstly the key to success this season will be the spine of the side. This means the midfield pivots co-ordinating their movement and staying in touch with each other and working with the number 10. This didn’t quite work out in this game but is no doubt something United will work on in training in the coming weeks. Where will the goals come from? This is the second issue. United didn’t have too many clear cut chances in the game. Rooney led the line here but was often isolated as a consequence of the gap behind him in the spine of the side. Again United will need to work on this but it is noticeably that whilst the back six are all tall payers now the front four lack height. 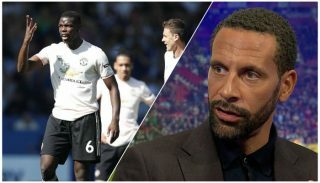 Van Gaal is no doubt looking for speed and understanding to compensate for this, but there will be times when a bigger physical presence will be required.